Press crescent rolls onto a large baking sheet. Bake for 10 minutes at 350. Cool. Mix mayonnaise, dressing package, and cream cheese until smooth. 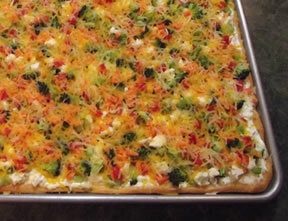 Spread evenly over baked crust. 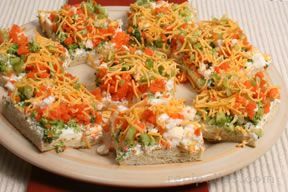 Sprinkle vegetable over mixture and top with cheese. Chill at least 2 hours. Cut into bars.